The morale mechanic has apparently fallen out of favor in later editions of D&D. I could paw through different books and the intertubes to find the exact edition where it went away, but that's not really what I'm interested in talking about. 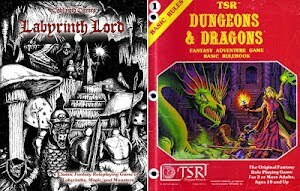 Rather, I'd like to talk a bit about how it is employed in many classic RPGs like B/X and why, in my oh-so-humble opinion, it is a very good thing. Any creature in battle may try to run away or surrender. Characters are never forced to do this; a character always reacts in the way the player wishes. NPCs and monsters, however, may decide to run away or surrender. 1) "Characters react in the way the player wishes." 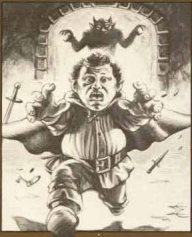 There are things like fear spells and effects (Giant Shrews, anyone?) that can effect a PC, but whether to fight on in the face of dire odds is completely in the hands of the players. 2) "Any creature in battle may try to run away or surrender." This is an element of morale that I don't always remember to apply. I usually just have a creature run away if it fails its roll. That's fine for dumb beasts, but an intelligent creature may throw in the towel (especially is escape looks unlikely).This can lead to fun RP between the victors and the vanquished, not to mention alignment considerations by the players. Remember how a decent charisma score can be a boon not only when hiring retainers (reaction rolls) but in giving them better morale? Here's a fun one: NPCs could decide to surrender to the bad guys if the PCs are losing a fight (or look like they might lose)! They might even switch sides! Weirdly, a counter-argument for not having all the hirelings just work for the one charismatic PC. If the NPCs are loyal to different PCs, that should mean separate morale rolls, which means it's not all or nothing when checking morale. Some minions might break while others remain. I mentioned realism and survivability. It seems perfectly realistic than not every encounter ends up a fight to the death. Sometimes nerves fail. Even a bestial predator may decide the PCs are not such an easy meal and take to its heels. BX gets a rep for being fairly lethal. Using morale in your game means some fights end a little sooner, which means fewer to-hit rolls against the PCs, thus less damage taken and fewer casualties. In a recent game, the PCs had a wilderness encounter with a nest of four giant scorpions. Fortunately for the characters, they were mounted and were able to turn things into a running battle where they literally ran the monsters in circles as they peppered them with arrows. The monsters could catch up with the PCs each round, but not also attack. By the end,the fight had become a simple matter of tedious attrition. After the session, I thought about it and how it might have been handled differently. Not to punish the players for using tactics, but to keep it more exciting. (Though honestly, they should have just run away). I chided myself a little for not applying circumstantial modifiers for things like terrain slowing them or giving cover from missile fire to the monsters (they were in a relatively dense forest). They main thing I found though was something in the rules as written that I have always been aware of, but seem to have difficulty remembering for reasons uncertain: In BX, initiative is supposed to be re-rolled every round. At some point in our group’s history with various editions and systems, we’ve fallen out of that habit and simply rolled for initiative at the start of an encounter. We use individual initiative as opposed to group, so at first I was thinking it was just a good way to reduce excess die rolling, but it turns out that rolling every round matters more than I first realized. For example, in the above circumstances the kiting players wouldn’t have been able to rely on going first each round (they’d rolled well) to evade the monsters again & again. One low initiative and the scorpions would do their thing. This ties into the rules for Defensive Movement, i.e. Fighting Withdrawal and Retreat (B24). To use these types of movement, one must declare intent to do so before rolling the round’s initiative. This increases the risks, but does keep things fresher. Keep in mind the rule applies to monsters as well as PCs. The other circumstance where an action is “pre-declared” in BX is spell casting. This one always catches me out because the rule is listed in Cook, not Moldvay. A character wishing to cast a spell that round must A) say so, and B) declare which spell before the initiative order is rolled. Again, upping the tension in the fight. I usually haven’t applied this rule in the past because I felt like it weakened already fragile spellcasters, but I am considering reintroducing it. 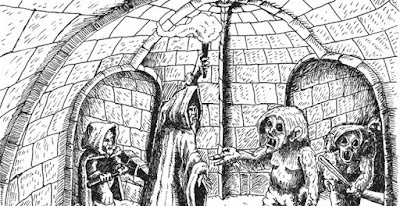 For a more detailed discussion on some of these and other mechanics, I highly recommend reading the “An Interpretation of Basic D&D” post over at the Basic Dungeons and Dragons blog. 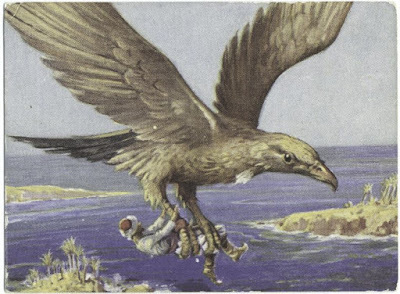 vb Wyrde over on the MeWe OSR group asked about who had used or encountered these critters in their games and I realized I had never done a Random Monster Assessment on them. These creatures appear in Cook Expert. This makes sense as they would be a handful for Basic level PCs and they are more suited to wilderness encounters (they do appear on the random monsters for dungeon levels 8+). They are on the flyer table for Mountain and Desert terrain, which also makes sense given their origin in persian mythology. So stat-wise, the manticore is pretty tough, but not unstoppable. Its AC is so-so for a 6 hit die creature. It has poor morale, too. What makes this fella formidable is a combination of factors. This makes a little work for the DM to keep them all in mind, but the result can be a pretty memorable encounter. It can fly. I know that's hardly unique, but it does add a wrinkle to facing one (or more) of them. It has ranged and melee attacks. In both cases it is potentially striking multiple times per round. The melee attacks (claws/bite) are not automatic kills, but if all three hit a single target, you're looking at up to 16 points of damage per round. A perfectly respectable number. The spike attack is nasty. 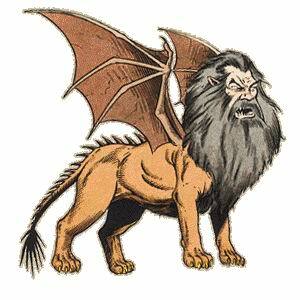 Granted the manticore only has four of them before his tail is empty, but each round that it uses it can mean up to 36 points of damage dealt out. And this is a ranged attack. "The manticore's favorite food is man." (X35) These things seek out people and eat them. They are not just dangerous, they actively hunt humans. Their chaotic alignment also points to them not feeling too terrible about it either. "They will frequently track parties with humans, ambushing with spike attacks when the party stops to rest." It's interesting to note that it specifically says "with humans." One reading of that could be distinguishing them from demihumans. So a party with a mix of races could see the humans specifically targeted. As a 6+ HD monster, it is capable of flying off carrying a man. Or, say, flying up 100' or so and dropping him on some rocks. Treasure Type D is pretty respectable, so I could see PC parties being foolish and greedy enough to seek out a manticore lair for the loot. Perhaps in a desert, where the creature(s) have made a den in an old pyramid tomb full of the gold of a lost king? If I was a player facing such an encounter, I would work hard to find a way to ground it (perhaps a Web spell?) then close to melee so it couldn't shoot me with those 6 x 1d6 spikes. While not part of the core BX roster of monsters, ghosts are in the Moldvay/Wells Basic series module Palace of the Silver Princess. You can also find a version in the Labyrinth Lord Advanced Edition Companion, but that always struck me as more of a 1st editon version ported over, so I'm sticking with the B3 version (I'm working from a pdf of the orange cover, if they are markedly different in the green cover version, please let me know). Ghosts are (obviously) a type of undead, and can be turned as wights. Their attacks have a 50% chance of aging the target by 1d8 years due to fright. 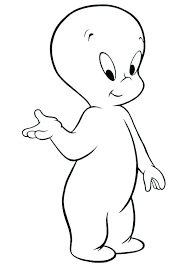 What's odd is that -while described as translucent- there is no mention of them being incorporeal or requiring any special weapons (i.e. magic or silver) to strike them. I assume the standard undead immunities, such as charm and hold spells, are still in effect. Overall I am unimpressed by this listing. Other than some mention of them haunting certain types of locales and the idea that rich and powerful people become "powerful" ghosts in the afterlife (whatever that means! ), it's basically a GINO (Ghost In Name Only). The Rules Cyclopedia's "Haunt" offers some more flavor, but it's still basically more monsters. I am record saying that the undead's scariness should be more psychic than physical. I don't feel that the classic D&D Ghost delivers on this one. I do feel that it has a lot of potential, though. For example, the aging effect is a nice twist, but it's a pity that there is so little in the rules to make this really matter to the PCs. Sure the DM can make a ruling, but it's unlikely to make much difference unless a PC gets hit several times. This is certainly possible, but in practice how does the DM decide when the unlucky character has burned through his mortal coil? Or aged enough to affect scores, etc.? An on the fly ruling here can feel a bit arbitrary to the player if it's his PC on the line. I know that other editions do cover this, but it's still a weak link for the BX version IMO. Instead of just aging, what if there was some other effect? Maybe the PC literally dies of fright or "System Shock" from aging several years in an instant? Save vs. Death Ray/Poison or your heart fails. I would keep the notion of ghosts being tied to something in the material world. It may be a place, or an object, or their own remains. It may even be their descendants (or those of their killer's!). Of course, the lack of "incorporeality" may just be a typo or oversight in the listing. Let's just put that back in, shall we? Like spectres, they have no solid bodies. I might also suggest that they have a higher chance of surprise (1-4? ), due to popping out walls and such. Magic or silver to hit them seems appropriate as well. I would also give it the ability to turn invisible so it can toss things about poltergeist-style. 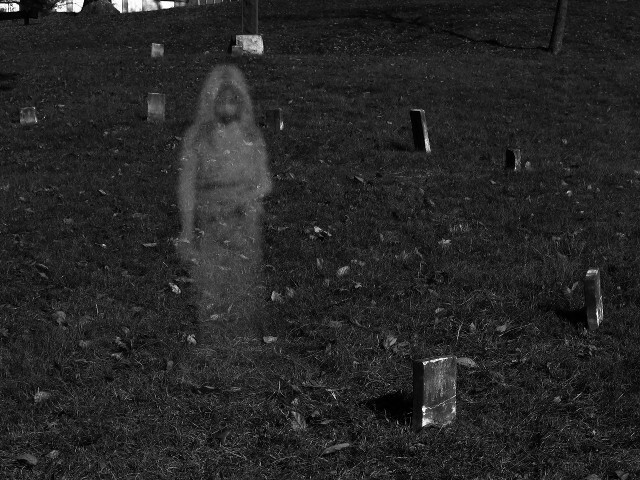 Finally, it may make sense to abandon the idea of the ghost as a "monster" altogether and think of it like a trap or puzzle. It is an anguished soul seeking release. The PCs could vanquish the spirit by laying it to rest. Maybe they need to bury its remains in consecrated ground or bring its killer to justice. Who knows? But it seems a heck of lot more spooky than some glow in the dark cookie cutter stat block. Switching things up from the last REF, I thought we'd go back to the dungeon. A random determination took us to level 3 of the crawl (Moldvay). The result? Medium. That's right. 1st level magic-user(s). 1d4 of them, actually. I rolled and got a 3. 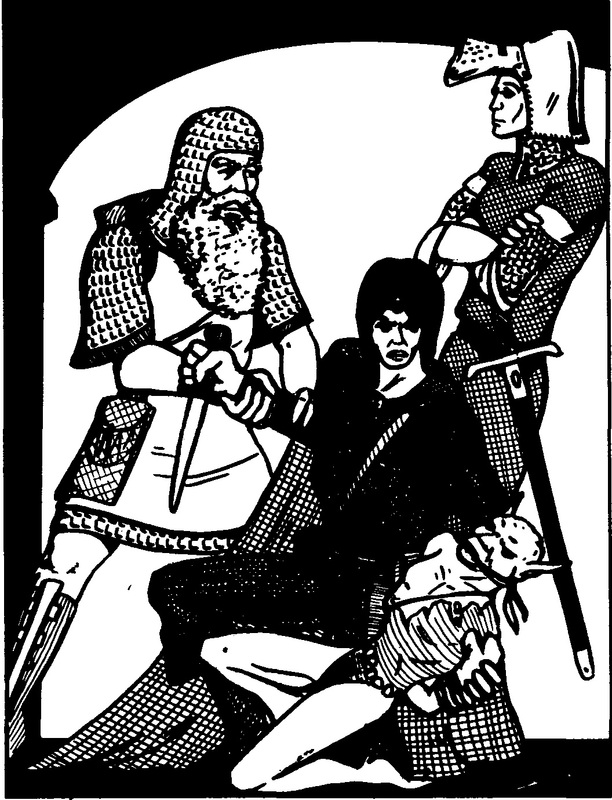 Three unarmored fellows with daggers and one spell apiece aren't exactly terrifying. Granted, the spells could be a challenge, but if our PCs are 3rd level on average, I doubt they're quaking in their boots, here. I decided to roll randomly for the spells for Huey, Dewey, and Louie. I came up with Read Magic, Protection from Evil, and Light. However, there is an interesting wrinkle to Mediums in the monster listings. There is a 50% chance that they are accompanied by a 3rd level MU, like a senior student or teacher. Rolling d100, I got 09, so guess who's coming along? The conjurer gets two 1st level and one 2nd level spells. Again, rolling randomly, it turns out he has Protection from Evil, Magic Missile, and Web. No wonder he was sent along to watch these three newbies! There's nothing inherently hostile about this quartet of spell-casters. Maybe they are searching the dungeon for some magic item or a spell scroll. Or maybe they're in the employ of the evil overlord and they are patrolling this sector of the lair. The point is that because of the fact that they are essentially NPCs (as opposed to "monsters"), they can have just as many motivations as the PCs for being in the dungeon. In my campaign, magic-users and elves need to find spells to fill their grimoires, so this encounter would be a huge potential win for them. Likewise, the mediums (and their 3rd level buddy) might covet the PC spellcasters' books. It's very plain-looking, but that sort of makes sense. I can't say that I recall this ever showing up in play for me. I've thought about placing one to see what players might do with it, but I don't think it's ever happened. The RoC is odd for three main reasons. 1) It's the only rod that appears in the Basic/Expert books. Which is strange that they created a whole category for just the one item. Of course the idea is that the RoC can be used by anyone, not just spellcasters, so I guess that was how they chose to indicate that. 2) It's one and done. The RoC carries one charge only. 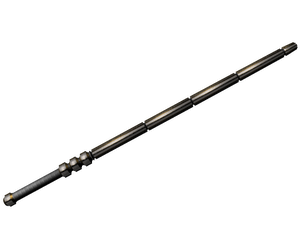 Granted, it has a powerful effect, but again, it seems radically different in this regard from its other cylindrical cousins (Wands and Staves). 3) It is incredibly likely to succeed in its function. i.e. destroying the enchantment of another magic item. It has merely to make contact (to -hit vs. AC 9 if opposed) and there is no save. The effect is permanent, too. It's a maxed-out Dispel Magic that anyone can use (once). As I looked at its description, I thought about ways it might be used in a game, and to be honest, I'm surprised I haven't used it yet. It could be a nasty gotcha for the PCs in the hands of a foe, but I would make it the object of a quest. Imagine hunting one of these down to destroy a lich's phylactery? Or negating the power of the BBEG's sword? Of course, the one charge means you have to resist using its power prematurely. Also, unlike Dispel Magic, you need to physically touch the magical object you wish negate. Still, this anti-magic dowel does present some fun possibilities. Keeping up with the Halloween theme, here's another classic monster. Mummies aren't rare in D&D, but they aren't always a "go-to" monster, even for undead. I think it's partially because of the exotic nature of the trope. We usually think of pyramids and deserts when we think of these relics, but many cultures besides the Egyptians practiced forms of mummification of their dead. Unlike other powerful undead, eg vampires or specters, mummies aren't necessarily intelligent or mindless. I've probably seen them most often played more like a ghost: either haunting some ruin or acting as an agent of vengeance against those who would defile a tomb or temple. From a purely combat perspective, Sir Wraps-a-lot here is reasonably respectable. He's slow, but that makes sense (shambling undead, anyone?). His AC plus the normal undead immunities and decent hit dice mean he can take a fair bit of punishment, too. A brief side note: I believe the Mummy is the only attack that uses the d12 damage die (as opposed to 2d6 or some such) in all of BX. Where the mummy gets really formidable are in its special abilities. In keeping with an earlier post about the undead being scary, it's worth pointing out that mummies actually have a fear effect rule. Just seeing a mummy forces a Save vs. Paralysis or the character freezes up. If the mummy moves out of sight or attacks somebody, the effect is broken, but still. I do like the idea of a character just locking up and not alerting the party because he's too scared to speak! 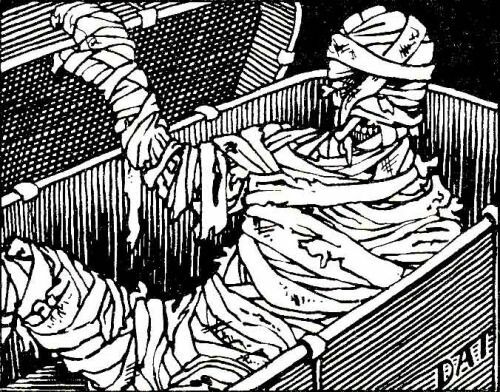 In addition to the 1d12 damage, the mummy's touch infects the victim with a rotting disease. What's curious about the disease is that it doesn't kill, it just prevents magical healing and slows any natural healing to 10x as long. According to Moldvay, normal healing = 1d3 hp/day of full rest. [B25] This would mean 1d3 per ten days of rest! Best find yourself a 6th level cleric and get a Cure Disease if you want those festering wounds to close! Lastly, in addition the usual undead immunities like Sleep, Charm, or Hold spells, the mummy can only be harmed by fire or magic (spells or weapons) and these only do half damage! I always think of mummies going up like a bonfire, but in truth they are quite resistant to flames. While it's true that a mid-level or higher cleric can automatically turn or even destroy mummies, if you are in their lair (lost temples and the like), there can be up to a dozen of them! That's 60 hit dice to turn, and that's not gonna happen. Mummies get a pretty generous treasure type (D). It's not "dragon hoard" levels of loot, but potentially quite profitable. Which is in keeping with why tomb robbers would bother with the risk of digging these linen-swaddled nightmares up at all! Now we come to the final entry among the were-critters: the Werebear. I've written about normal bears before. The were version is a fair bit tougher, stat-wise. In fact, they're closer to cave bears. If provoked, these creatures are pretty dangerous. Their armor and morale are quite respectable. In addition to their normal 3 attacks, they can hug for an additional 2d8 damage if they hit with both claws. That's potentially 4d4 + 4d8 damage to a victim in a single round! That's an average of 28 points of damage. Even if that doesn't kill a foe, it could easily set them up for lycanthropic infection; even a name level fighter (9HD) only has an average of approximately 30-40 hit points. 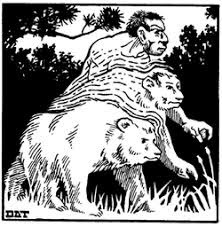 As formidable as they are on the lycanthrope ladder, werebears in D&D are interesting for being the only ones listed as potentially friendly. They are also described as "very intelligent, even in animal form." This is taking a pretty far step from the raging beast within stereotype of things like "Wolfman" movies, etc. In fact, I wouldn't be surprised if a lot of the inspiration for this particular -ahem- "skin changer" came from someplace else. hmmmm. What could it be? To be fair, there is a rich tradition of shape-changing bears in Native American folklore, too. 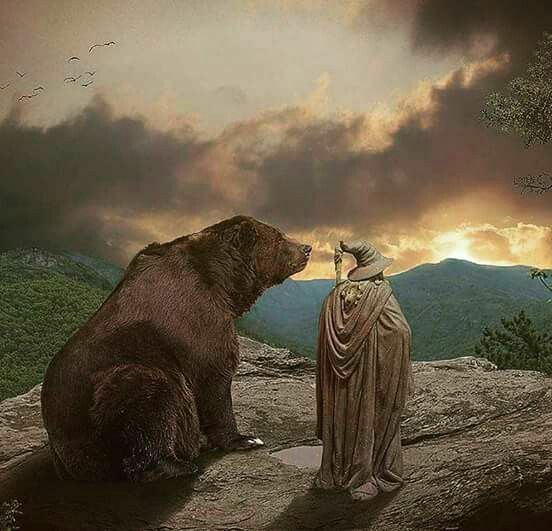 I can't help but think that Beorn is at least part of this monster's origin, though. I've talked about tigers before on this blog. It's pretty obvious that they are intimidating creatures all on their own. Weretigers add a layer of fun with the lycanthropic powers. So we can see that the weres are getting progressively tougher in terms of raw combat power; better AC more hit points, 3 attacks now, doing up to 24 points of damage per round. All very impressive. The thing that the weretiger brings to the table is stealth. They surprise on a 1-4 (like normal tigers) and are described as "quiet trackers." This fits with normal tigers behavior in the real world. They are ambushers, moving with alarming speed and savagery when they want to. Warning. There is some blood in this video. 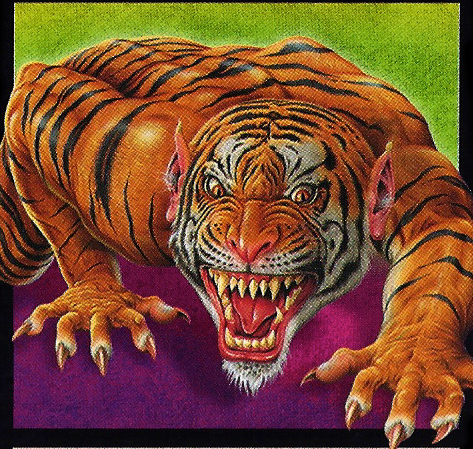 Couple this with the weretiger summoning 1-2 more great cats to its aid (not necessarily tigers), and a party can be in for a rough time. Weretigers are also the first lycanthrope with enough hit dice to be immune to a Sleep spell, so the easy 1st level spell drop is no longer an option. 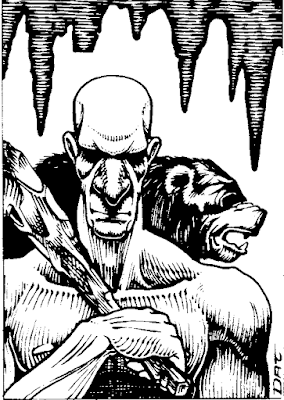 Weretigers, like wereboars, are Neutral. They are described as "very curious but becoming dangerous when threatened." This implies they aren't necessarily out to cause trouble. Which is an interesting difference from the classic "killer werewolf" trope in fiction. It may just be me, but this gives an impression of lycanthropes sometimes just going about their lives and being a regular part of a BX world as opposed to the tormented, evil, or cursed individuals wreaking havoc. Weretigers also move things out of the western/european model into the "exotic east." Despite the fact that weretigers do not appear on the jungle encounter tables, one would expect to see them (or their mundane counterparts) in a tropical or eastern style locale as opposed to a "medieval fantasy" type village. Wereboars are an odd one to me. 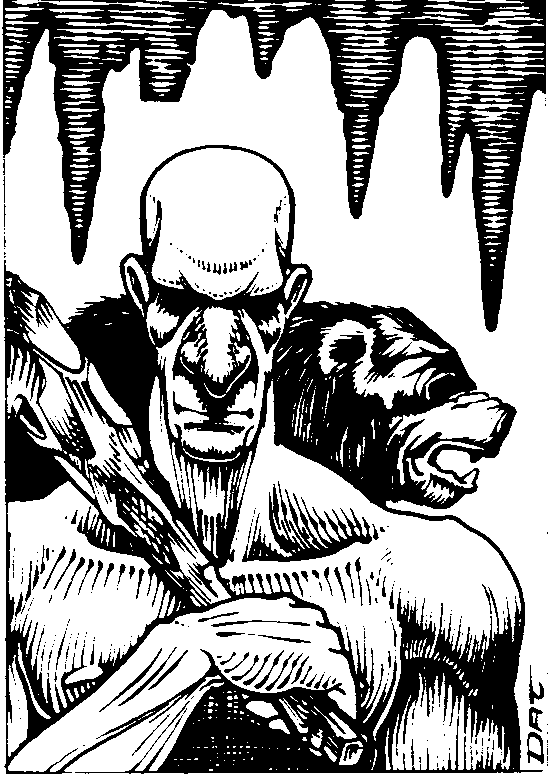 I've espoused my love of their bigger, wackier cousin the Devil Swine, but the "normal" porcine shapeshifter is not one I've seen in use much in D&D games I've played or run. Looking at the stats, a couple of things occur to me. Wereboars are the first of what I would consider the "tough" lycanthropes. They don't appear as a wandering monster until the Expert Set levels (4th) and their Armor Class, Hit Dice, and Damage are getting more respectable. Even without being a were-creature, a sounder of them would be a decent opponent for low to mid level PCs. Another interesting thing is that they are the first in the ascending power scale of these creatures to be neutral, instead of chaotic. This implies they aren't necessarily some evil monster. Leaving the stat block behind, let's look at the description. They are listed as "semi-intelligent," which means they won't necessarily charge blindly into a situation, but they do have "bad tempers." Poor reaction rolls, maybe? They can do the animal summoning thing too, bringing normal wild boars to the fight. These are not insignificant creatures, especially if each lycanthrope is calling a couple in. An interesting tidbit here: "In human form they often seem to be berserkers, and may act the same way in battle (gaining +2 on 'to hit' rolls and fighting to the death)." [B39] Two things about this. First, in were form their morale is a nine, as opposed to the "never surrender" aspect of berserkers (which they do not do as boars, but as men). Second, this makes them pretty scary even out of their magical form. Another thought is that I can imagine a role for such people in some warrior societies. Almost like a "mystic order" of warriors that are infused with the "Spirit of the Boar" and charge berserk into battle and transform into beasts in the heat of the fighting. Reading over the material, it strikes me that one of the main ways wereboars can be effectively used in a game is tapping into the tremendous amount of folklore that surrounds the idea of pigs and boars being demonic or supernatural. There's as much about evil pigs (if not more) than werewolves in the really old stories. Granted, they aren't all lycanthropes in those stories, but the imagery is there. For example, the Cutty Black Sow is a welsh tale of a creature that steals mens' souls on what is now Halloween. DMs looking for ways to weave a spooky wereboar-related adventure have no shortage of material to mine. Next up in our look at lycanthropes are the wererats. There are several things about these creatures that make for an interesting encounter. Stats first, shall we? Note the attack listing. They are the only standard lycanthrope that can wield a weapon in bestial form. It's important to note that damage from their weapons won't infect a person with lycanthropy, only their bites. But the really unusual stuff is in the description, not the stats. They are not humans that turn into rats, but rats that turn into humans! The description on page B38 clearly states this. It is a little unclear how this works with infecting a human with the disease. Since the character becomes an NPC after they go "full were" it's not too much of an obstacle in play. Personally, I like the idea of regular rats getting infected and then being able to turn into humans! They have three possible forms instead of two. 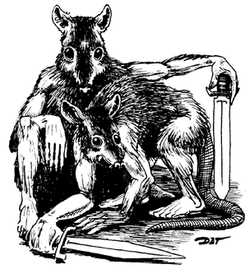 Wererats can A) be rats, B) be humans, or C) assume a "man-sized rat form." While imagery like the Chaney photo from the last post popularizes the idea of the "hybrid" forms for lycanthropes in general, by the book wererats are the only ones. Other weres are people that "change into beasts." None of the other descriptions depict a "man-beast" form, so an argument can be made that they are just wolves or boars or whatever when transformed. They are intelligent and can speak Common in either form. The general description for lycanthropes' animal forms says they cannot speak normal languages but can communicate with animals of their type. Again, wererats are an exception to the rule. They may speak in human or "man-rat" form. When they summon regular rats to aid them, they get giant rats instead of normal ones. Tactically, wererats are clever, setting ambushes with a high chance of surprising foes. Their ability to change into much smaller than human size also makes them quite capable of infiltration and stealth. I can envision using them in scenarios like a chaotic master thief who retains a cadre of wererat spies. Once again, Halloween fast approaches. It is easily my favorite holiday of the year. This reminded me of my post last year about classic monster movies. 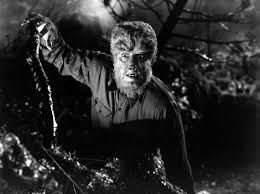 It then occurred to me that I have never done a Random Monster Assessment (RMA) about the classic lycanthropes. I have discussed the Devil Swine, but he's not a typical example of this grouping of monsters. So without further ado, I am diving into a series of lycanthrope RMAs starting with the classic of all classics, the werewolf. First off, let's get the stats out of the way, shall we? At first it doesn't appear that intimidating. Its armor class (in were-form) isn't too bad and it has a low morale. Four hit dice means it isn't dropping in one shot, but it isn't exactly a dragon, either. Of course, what makes the werewolf and other lycanthropes interesting (and scary) as foes are the devils in the details. It's common knowledge that werewolves are not harmed by normal weapons. It requires magic (weapons or spells) or, of course, silver to damage them. Silvered weapons aren't too hard to come by in your typical BX setting, heck they're on the standard equipment lists along with things like wolfsbane (we'll get to that), but not every weapon has an argent version. By the book, only daggers and arrows are available this way. I have had players do things like melt down silver pieces into sling bullets and coat crossbow bolt tips with the metal, but I usually draw the line at things like silvered swords and the like. It's not that the metal is so expensive, it's that the process won't hold that much of an edge. 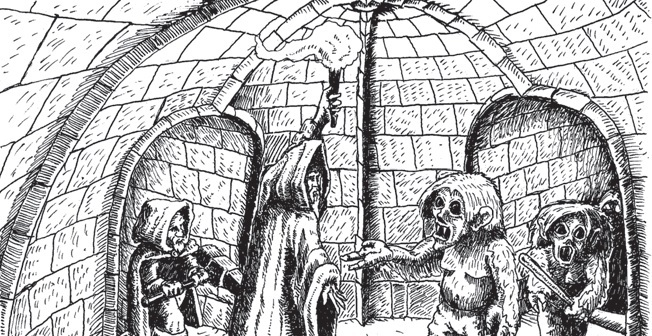 I did once see a player at a con have his cleric use a silver candelabra as an impromptu blunt weapon, though. Magic weapons and "battle" spells are pretty obvious, as that +2 Axe or Lightning Bolt spell is going to work against most any critter you use it against. Aconitum napellus, or Wolfsbane, is an interesting bit of folklore that was added to the monster listings. I've discussed it in more detail in the previously linked blog post, but the idea that one can drive the were away without killing it, coupled with a werewolf's low morale lends itself nicely to the idea of the creature being driven away by the superstitious peasantry and remaining at large for an extended period; perhaps over several nights, months, or years? Moving on. All lycanthropes can summon their mundane counterparts. So werewolves can summon regular wolves, wereboars normal boars, etc. Having 1 or 2 wolves show up to the fight a few rounds later might knock some PCs off balance a bit. Werewolves are particularly nasty foes because they tend to run in packs. In groups of five or more, there is an "alpha" with an extra HD and a damage bonus plus the normal summoned wolves to pad the ranks. 2-12 werewolves with 1-2 wolves each means a lot of fangs running around underneath a full moon. And their hair was perfect! Lastly, I should mention the disease of lycanthropy itself. There are a few interesting things about it. First of all, there is no save! If a character takes more than half their hit points in a fight with a were-creature, they are infected. Secondly, it only fully manifests in humans. It just flat-out kills demi-humans! Granted, humans or otherwise have a little time before the disease takes full effect (one way or the other) and can seek out an 11th+ level cleric to cure them of the disease. This is doubly interesting because A) Cure Disease is a third level spell, which a cleric would have access to by sixth level. B) There isn't anything specific about an eleventh level cleric's abilities that seem to jibe with this power. No access to new spell levels and they were already name level. So why 11th? The only thing about this particular level cleric that I see is that is where they reach the highest tier on the Turn Undead table (11+) and can automatically Destroy any undead up to Vampires. I would say it's because lycanthropy is a magical disease, infecting one via a magical creature, but mummies' rotting disease is curable by the spell. I expect it was probably a case of where the Expert rules were assumed to be going to have something for it when Basic was released, but things got tweaked after the first book was published. This is a powerful, if limited, item that I have rarely seen in play. It won't keep that sword out of your vitals or that lightning bolt from frying you to a crisp, but it can definitely save your bacon.. Unlike a ring of protection or similar, the scarab doesn't up your armor class. Rather, it absorbs certain evil magics, keeping them from harming the wearer. Specifically, it blocks curses and the "finger of death" spell. Let's start with the latter. Finger of Death is the reverse of Raise Dead. That's a 5th level clerical spell and only certain clerics (i.e. evil/chaotic) are probably ever going to be casting that version. Despite the fact that this situation may not arise too often, having an item that just nullifies it is pretty amazing. Now, as the scarab has limited charges, I would probably allow the targeted PC their saving throw vs. Death Ray first, then -if they failed- take off the charge from the scarab. 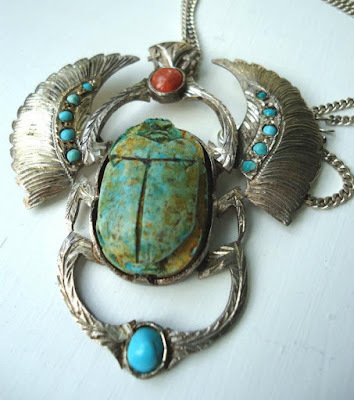 What's slightly more likely to come up is the scarab's ability to absorb curses. The description specifies that the curse can be from "spell, scroll, or other effect." In other words, nearly anything. In a BX world where you have cursed magic items, the curse spell, and even certain creatures with the spell-like ability to curse PCs, being able to shrug such things off is not trivial. While the description doesn't specify, I would rule that it would even protect from things like picking up a cursed magic sword or similar, as such things usually require a remove curse to get rid of. The scarab only comes with 2d6 charges, but there's no difference in cost for what it stops. So whether it's the Baleful Bishop casting finger of death at you, or a sprite giving you warts, it still costs one charge to block it. The spent scarab is useless and cannot be recharged. It's important to note that the text says nothing about existing curses. Thus, it won't remove a curse that's already in place (just as it wouldn't resurrect someone already killed by finger of death). So putting the scarab on an afflicted character won't help. This is another one of those magic items that could add a lot of flavor to an adventure or an NPC without drastically tipping power level with outrageous combat bonuses or similar. Likewise, a PC that finds one may be a bit underwhelmed initially, but as soon as that shaman's curse "bounces off" him, he'll be feeling differently about that little bit of bling. I am not a fan of how later D&D editions (particularly 3.X) reduced magic items to a simple commodity. I get that some of the rules about crafting costs and times were a bit subjective before, but I fall into the camp that magic should be magical. That being said, players will want to find ways to spend their loot and one of the most useful things for an adventurer is better gear. Once the fighter has bought plate mail and silver arrows, his upgrade options in the standard price list are a bit thin on the ground. I sometimes do have the odd item or two for sale in towns. Usually it's things like potions or scrolls and other "limited" magics. In the current campaign I am running, the PCs have managed to get through two adventures, both times clearing a fair amount of coin; enough that the PCs that have survived since session one are at or near level 3 (except the elf). The nature of the adventures limited the chance to find items, though. I am thinking of giving them a chance to acquire some magical shinies. The question is how to decide what's available in such situations without being utterly arbitrary. It's up to the individual DM to decide where a given population in his setting falls on this list. As examples, I would say a town like Threshold in Karameikos would be a medium town, whereas Specularum might be a small city. You might also tweak how you roll based on things like how much trade or traffic a location sees or if adventurers are common there. In my campaign, the party is currently in a town of 3,000-4,000 people; what I would consider medium-sized in my setting. But, it is also a busy river port that sees a good deal of trade and adventurer types are not uncommon here (a name-level mage has a tower just outside the town walls). Therefore, I have chosen to roll as a large town/small city. 1d4 Scrolls = 1. The % dice came "00"! Which is a nice treasure map to 5d6 gems and 2 magic items. 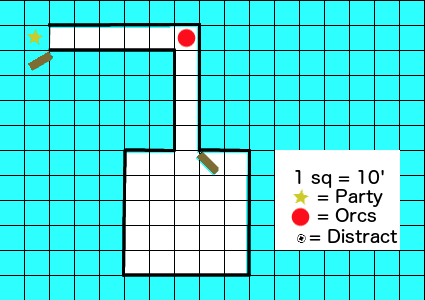 Buuuut, the party is already following one map and I am trying to generate magical items here. So I re-rolled that and got a Protection from Magic scroll. % dice for other magic = 30 exactly (!) So 3 items plus 1 arm or armor. I rolled a d3 to see which and got a 3, which is a non-sword weapon. A MU/Elf spell scroll of 3 spells. This came up as one 4th, one 1st, and one 2nd level spell. I rolled randomly (d12s) and got Charm Monster, Ventriloquism, and Detect Evil. Now this is a pretty impressive haul, and frankly a lot more magic than I like to be just lying around. If I want to let these results stand, I need to make sure these items aren't too easy to get. Namely, they need to be expensive or require the PCs do something to get them. The protection scroll has a lot of potential utility, but it's one use only, so I will peg that at 1000gp. The +1 spear is nice, but is just a bonus to hit and damage. 1000 gp should cover that. The healing staff is another matter. I will invoke DM fiat and say this is too powerful to be simply bought in town, ready to go. This item essentially allows a cleric to cast a Cure Light Wounds once per day on each PC and uses no charges! This sort of thing would be snapped up by one of the temples in town and not readily available to wandering murder hobos. As with the map, I re-rolled and the result was a Staff of Striking with 18 charges. This is a nice item, but limited by who can use it (clerics) and of finite charges. I will judge it roughly equivalent to the spear and set its price at 1000 gp as well. The spell scroll would be pretty expensive. I have previously established house rules about spell books and scrolls, so using those I can pin its price tag at 3,500gp (7 spell levels total at 500 gp per). Since they are all on one scroll, it's an all or nothing price. Now, this is a pretty generous haul, but the rolls were with them. The odds favored 2-3 scrolls and that's it. I would also argue that it would be a while (a month or two at least) before this particular town might be "restocked." Over the course of a campaign, I would see this as balancing out. I'm not sure it's the perfect system. I still needed to intervene a little to maintain what I see as a correct balance, but isn't that what DMs are supposed to do? 3 copper pieces if you know where that image is from! Miscellaneous magic items (MMIs) are always an interesting read, as they cover what I consider the really "magical" part of magic items. Magic weapons or armor are usually just combat boosts, and scrolls or wands are mostly more spell slots. But MMIs? The sky's the limit. They might be boots or bags, musical instruments or jewelry, who knows? And who knows what they'll do? Sometimes their powers are passive, sometimes they have only a few uses. Often their abilities come with a price or a twist. 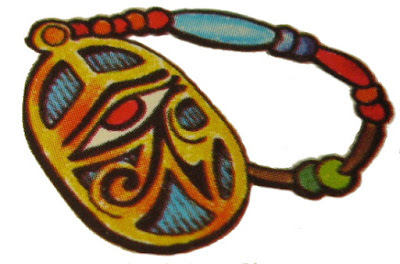 Case in point is the Medallion of ESP. This is an especially weird entry as there are two versions of it: The 30' range one in Moldvay, and its 90' cousin in Cook. Let's start with Basic, shall we? The medallion has no charges or limited uses per day. It merely requires a round of concentration and limits what the wearer can do while concentrating (no fight, no spells). One need not be a spell-caster to use it, either. It should be mentioned that its effective range is shorter than the spell's, but its duration is limited solely by concentration. This item's fun tidbit is that it malfunctions 1 in 6 times, causing the reverse effect and broadcasts the wearer's thoughts to everyone within 30'! I find that very funny and with great plot twist potential. This also ties in neatly with my ideas on magic having a cost. The Expert rules add a second version of the medallion. This one with a 90' range. It's description is also somewhat different. This one merely mimics the 2nd magic user spell with the slightly farther range (90 vs 60'). This is interesting for two reasons. One, it's not only replicating a spell, it's improving upon it. Secondly, it puts me in mind that the basic version could be seen as a sort of a "flawed prototype" with less power and with some bugs in the system. I don't know why, but that just seems very "BX" to me. Looking over some of the responses to the last post, where I talked a bit about wandering in the wilderness, it seems that people find rules explanations useful. So I thought I'd take a whack at a couple of BX rules that seems to generate confusion for some: Pursuit and Evasion. In Basic, the pursuit rules are simply what happens when one side of a (potential) fight runs and the other gives chase in a dungeon. Obviously if the PCs are one of the sides, and the faster of the two, chances are what happens is whatever the PCs want to happen (they catch up, they let them go, etc.). Here's a basic scenario for pursuit and how it would break down. Unlike the last time, I've already rolled it out and know what happened, so I can provide step by step maps. The Setup: A band of brave(ish?) adventurers have entered a dungeon. They open a door and step into the room to discover a pack of orcs. Round 1: Surprise rolls are made and both sides roll 2s. The PCs and orcs stare stupidly at one another for a moment. Round 2: Initiative is rolled. The orcs get a 5 and the PCs a 6. 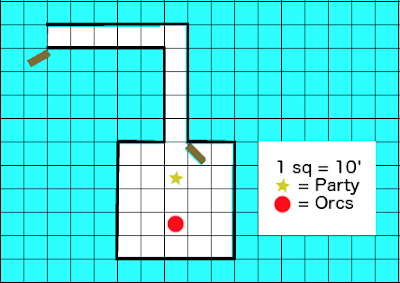 The orcs' reaction roll is a 5 indicating they are hostile and will probably attack. The party doesn't like the look of all those snarling tusks and decides to beat a hasty retreat. They use their running speed for movement (60'), which gets them to the corner turn in the hallway. The orcs take off after them. The monsters have a move of 120' so they can catch the PCs if they want, but the party's magic-user cleverly tossed a pouch of coins on the ground behind him as they fled. There is a 50% chance the orcs will stop for the loot and it turns out they do (I rolled a d6. Odds they ignored it, evens they stopped. I rolled a 4). Round 3: The PCs move another 60' and reach the outside and daylight. The DM rules that since the wizard dropped the whole pouch and didn't scatter the coins, it only took the one round for the orcs to retrieve it. They run down the hall and see the PCs out in the sunshine. The DM rules that the orcs don't like the idea of fighting in the daylight and break off pursuit. Now, there were a lot of things that could have happened differently there, but that gives you a short & sweet version of it. If it had been an unintelligent creature, like a giant lizard or some such, the party might have dropped food instead of treasure to distract it. The scale of wilderness pursuits makes mapping it less useful. The rules themselves favor a more abstract method as well. In a nutshell, if one group is surprised and the other is not, the latter may automatically avoid the encounter: remember the wilderness random encounter distances are 40-240 yards! If a group that did not surprise the other wants to avoid an encounter, and the second group isn't having any of that nonsense, then the Evasion Table on X23 is used. The DM is encouraged to make ad hoc rulings for factors like terrain, speed, or whatever is deemed relevant. A group of four PCs and their three hirelings are traveling in the forest when they spot a group of 10 gnolls though the trees. The DM rolls for encounter distance and gets 100 yards as a result. Neither side is surprised (they spot one another simultaneously) and the gnolls seems hungry. The party decides this is a fight they'd rather avoid and flee deeper into the foliage. The party has 7 people total, the gnolls 10. This gives a 70% base chance of losing their pursuers. The DM also rules that the tree cover is thick enough to grant a +10% bonus (it would have been higher, but the gnolls' are keen-nosed). This gives the party an 80% chance of success. The dice are rolled and come up 44! The party spends a tense several minutes fleeing into cover and waiting for the gnolls to lose interest. If the odds weren't as favorable, the party could have upped their chances by splitting up, as smaller groups are more likely to evade bigger ones. The party successfully evades or stops trying to run. The gnolls successfully catches them. The gnolls give up the chase. There are no specific rules for time increments in a wilderness pursuit, though the text mentions the possibility of a chase continuing for "several days." I feel like there must be something in the books (there usually is), but I don't see it. If I were to run such a situation, I would say each evasion attempt takes an hour, giving the abstract nature of moving through terrain, hiding, looking for signs of one's quarry, etc. So the next time your group decides to exercise the better part of valor and skedaddle from certain doom, or decides to chase down those wascally kobolds, hopefully this will help clarify a few things. I had written a longer, more rambling post that bounced between general thoughts on resource management to critiquing how such rules are often applied in-game. After looking over that train wreck of text, I opted to delete most of it and start over with a simple walkthrough of overland travel rules as sort of a Random Encounter Fun (REF) entry, but with a little more focus on rules instead of a specific critter. 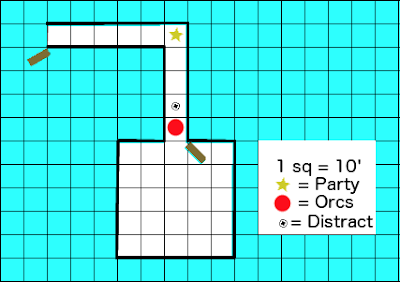 A lot of players (and more than a few DMs) complain that tracking every little thing can be tedious. I find the main issue players have is that they fail to plan well before the actual adventuring begins, and DMs fail to take some of the factors that will matter into account when they plan the session. There is a terrific example of an expert level party preparing for an overland journey on page X19. If the players know that you (the DM) will be having them track resources consistently, and you as DM are keeping track of time, then it can all flow fairly smoothly. It's really just a question of organization and some minimal prep. Here's an example of what I mean by minimal. This is a map I made in about 5 minutes on the computer. It's all I need to run an overland adventure with the rules in the book. I've set no fixed encounters. If I wanted, I could include several days' worth of weather for added detail. All rolls in this example will be recorded as they happen. As of writing these words, I don't know how this will play out. The premise? 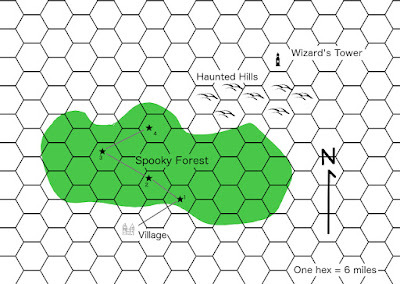 A party of four PCs start in the village. They have heard rumors that the wizard Examplo the Mad is likely dead and his evil tower to the Northeast is ripe for the pickings. To get there, they must traverse the Spooky Forest and the Haunted Hills. They know it's about 40-50 miles. There is no road, which means A) slower travel times, and B) they would be wise to seek out a map or guide. Sadly, our heroes are more bold than wise and decide they merely need to steer NE and they'll get there eventually. They do have enough sense to buy rations for two weeks apiece (x 4 = 56 days) plus bedrolls, tents, and a mule to carry most of the extra gear. Under these conditions, the PCs can travel 12 miles per day on open ground (Their slowest member moves at 60'). The DM also decides to only roll for encounters once per day and once per evening's rest. Day 1: The land outside the village is open grasslands with trails made by trappers and woodcutters leading to the woods. The DM rules no problem, the path negates the chance of getting lost. The PCs camp that night just inside the forest. There are no grassland or forest encounters (52 days' of food left). Day 2: The trails don't go far into the forest, so now the PCs (lacking a map, guide, or personal knowledge of the terrain) need to rely on their own senses of direction. They are also moving slower (2/3 normal rate for wooded terrain = 8 miles a day). For simplicity, we'll call it (very) roughly 1.5 hexes. Day 3: Another roll vs getting lost. A 3 means they stay on course. Mind you, they still think NW is NE. Since they are still deep in the Spooky Forest, they have no landmarks to set them aright. More bad news as an encounter comes up for the their night's rest. A 2 (flyer) and an 11 for woodland encounters means sprites! The DM rules that the quiet little clearing where the PCs have unknowingly bivouacked is quite near the lair of 22 sprites. A reaction roll of 9 lists as "leaves or considers offer." Now normally I'd say that would be the end of it, but sprites love their pranks so I don't think they'd let the PCs go scot free. The DM decides that the little jokers pull the mule's picket and then spook the poor beast. While the PCs chase it down, the sprites steal 11 days worth of food (one half per sprite) from the saddlebags. The PCs eat their dinner and try to rest (33 days' left, leaving a week for each of them). Day 4: Another travel roll yields a 1. Lost again! Direction roll is a 3. Two wrongs make a right and they're back on track, heading NE again! Their luck doesn't hold though. A wandering encounter roll during their days' travel comes up an 8: Dragon! "Luckily" it's not a REAL dragon, just a puny ELEVEN-HEADED HYDRA! Now, I'm not going to roll out a whole combat here, but it's probably not unfair to say that there are pretty good odds of four measly PCs getting their collective lunches handed to them here. And so, our noble heroes meet their fates in the Spooky Forest, never reaching the wizard's tower. If they had only had a guide or map, they might have avoided such a fate. Or not, random encounters be nasty! There, now. That wasn't so hard, was it? 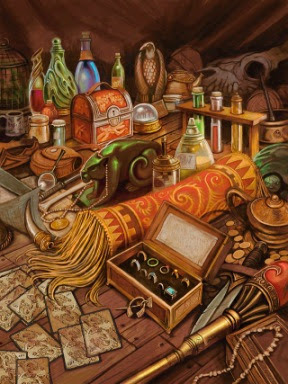 When one thinks about finding magic loot in D&D, images spring to mind of glowing swords, magic potions, powerful rings, sorcerous wands, and enchanted armor. The real fun begins in the Miscellaneous Magic tables, though. Crystal balls, bags of holding, magical amulets, and magical cloaks are all classic finds in a dungeon or lair. All of the above share one similar characteristic: portability. Even a flying carpet, which can seat up to three people and is hardly small, is still by its nature easily moved. There are, however, a few items which -while not immobile- can't be so easily transported. This is the largest of the elemental summoning items (X50). It's described as a 3' diameter bowl. I imagine it as a birdbath-like stone basin, but I suppose it could be metal (or an enormous seashell!). Whichever way you imagine it, a 3' bowl is not something one stuffs in a knapsack (weight/encumbrance aside). It only works 1/day and takes 1 turn to prepare. Also, the caster cannot move or cast other spells while controlling the elemental. None of this lends itself to the bowl being moved around a lot. 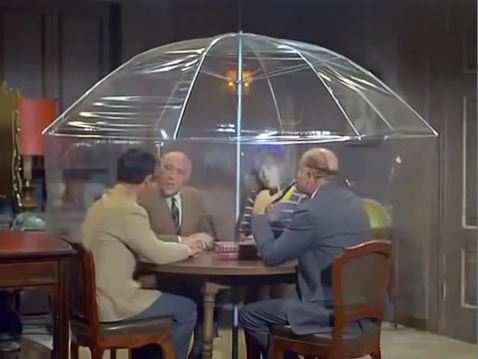 I can even imagine it being a fixture in a wizard's tower, as part of its defenses. This would work especially well if the structure was located near a coastline, river or similar where the elemental can operate easily on or in the water. 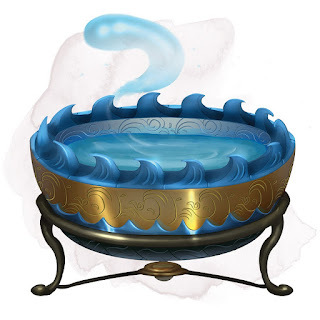 The brazier is the next largest elemental based item after the bowl. 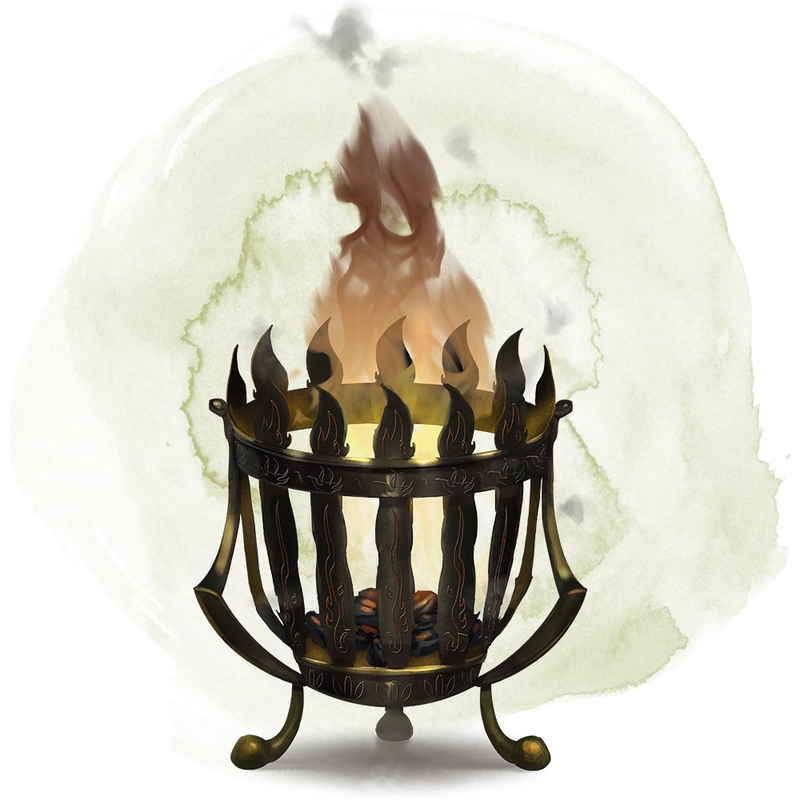 Braziers are defined as a pan for holding burning coals, usually for cooking and typically with a stand or legs. Braziers are designed to be portable for things like camping, but certainly not carried while lit! Cook's Expert doesn't give an exact size, but a foot or more in diameter and height isn't unreasonable. 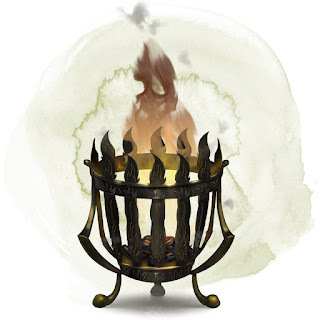 As a DM, I would interpret this item's 1 turn preparation to include lighting a fire for the elemental to "ignite" from. It also carries the same restrictions about the caster moving about or performing other actions while concentrating on controlling the elemental. "This item is a large, heavy, sealed jug about 3' high." (X50). 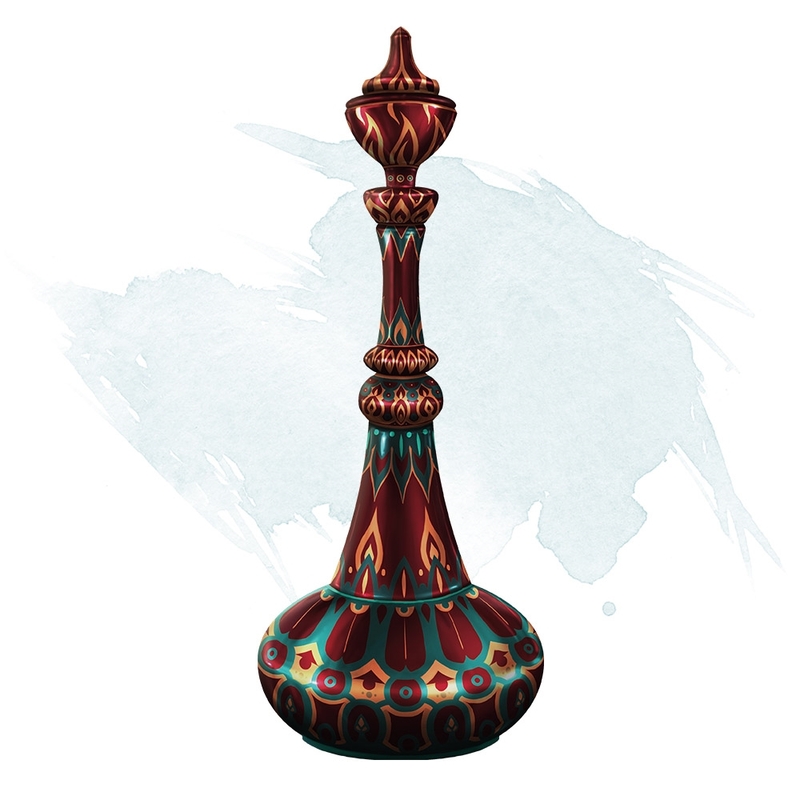 Now, unlike the elemental items, nothing in the bottle's description says one needs to have the bottle once the efreet is bound to the one who freed it, but it could be fun to require it. Perhaps it retreats to the bottle each day after it's completed the task required by its master. The possessor of the bottle must pop the cork each time he wants the efreet to do something. Remember that "[Efreet] are reluctant and difficult servants and will obey their instructions exactly, attempting to distort the meaning of whatever they have been told to do in order to cause trouble for their masters." (X31) So why would it make things easy for the clown summoning it over and over for 101 days? Making the PC drag around a Nebuchadnezzar full of surly smoky servant would probably amuse it. This item is described as "large kettle drums" (plural). It's even in the name: it's not "DRUM of Panic" after all. 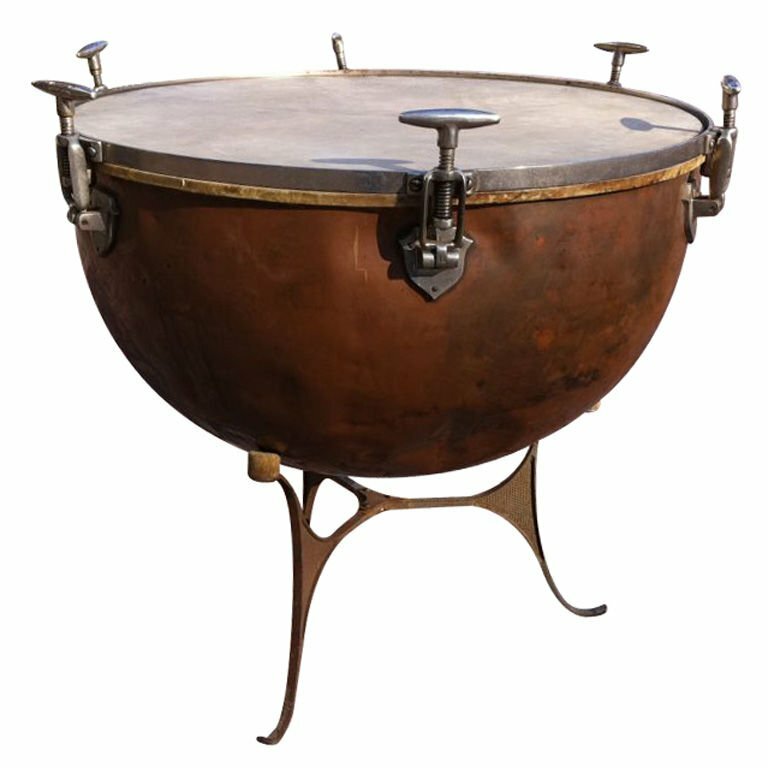 Now, timpani come in different sizes, but the large ones are about 30" in diameter. Not something one just totes along through the dungeon. Of course the drums' function is better suited to a battlefield situation. It's interesting to note that the save vs magical fear is replaced when the "optional" morale rules are used with a simple -2 modifier. Again, this is an item I see used as a defensive measure for a castle or keep, but you'd have to work out the logistics of not affecting friendlies who are farther than 10' away when the drumroll starts. 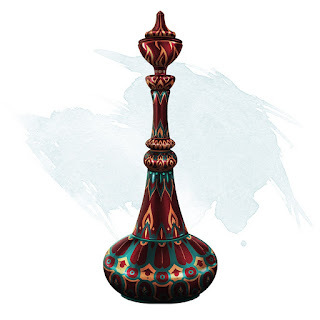 Of course nothing says the DM can't make other interesting magic less of a snatchable bauble and more of a fixture or even occasionally left at home. 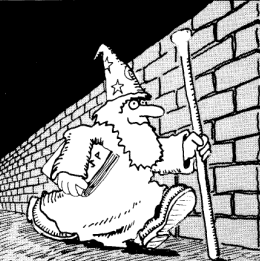 It may make the players have to think a little harder about how to take advantage of "big magic" in the game.